March 29, 2016 - This morning, Egyptian air carrier, EgyptAir, Flight 181 departed Borg El Arab International Airport, Alexandria, Egypt for Cairo International Airport at about 6:36 AM local time with 56 passengers, 7 crew members and 1 security officer onboard a Airbus A320. Enroute Flight 181 was hijacked by a passenger who claimed to be wearing an explosive belt, the Airbus A320 was forced to be diverted to Larnaca International Airport, Cyprus and landed at 7:15 AM local time. The airport was shutdown and the pilot taxied the aircraft to a secure area. The hijacker demanded from authorities that he wanted to see his estranged wife, female prisoners being held in Egypt must be released and he was seeking asylum in Cyprus. Negotiators were able to convince the hijacker initially to release some of the passengers. At that time all but three passengers and four crew members were released. The hijacker was identified as Seif El Din Mustafa, an Egyptian national. During negotiations, one of the pilots climbed out and jumped from the pilots window and landed safely onto the tarmac. 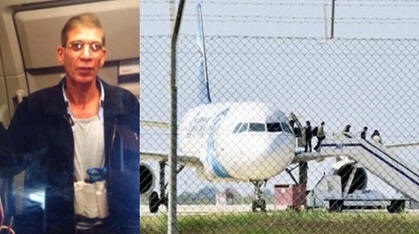 At 11:45 AM Cypriot foreign ministry reported the hijacking had come to an end and the hijacker was arrested. Authorities have reported the explosive belt the hijacker was wearing was fake and the hijacker is mentally unbalance and his actions were not terrorist related.